Lizzing Lightly: From Trash to Treasure... Are Santa's Elves Upcycling Toys? From Trash to Treasure... Are Santa's Elves Upcycling Toys? It is a foraging time of year in our area at the moment. People in the neighbourhood are clearing out unwanted items for Council collection. About two weeks ago things started to appear on the streets. It really hit a peak last weekend with people driving around in vans looking to snap up some treasure. You might notice I am hesitant to call the unwanted items rubbish or waste. This is because most of the time it is not. Mostly it is unwanted or underused things that are taking up valuable space in our homes. With Christmas on the way toys are also being cleared out in anticipation for Santa's arrival in a couple of weeks. As initially raised in Striving for a Minimalist Birthday we are trying to make sure Turtle's baby toys are secondhand wherever possible. We had a lot of luck from the verge collection. Mr Fix It went out Saturday night (we have such an exciting nightlife!) and came back with a car full of things. A roller lawnmower that is compact and doesn't need fuel or electricity to run, an old wheel barrow that we are going to plant out with something (possibly mint) as a feature in the yard, two kids bikes (that went back on the curb since they were broken) and a really great activity table for Turtle. We gave the salvaged activity table from Mr Fix It's big night out a good clean and it is practically like new. Only one of the features is broken and it still plays music. Since we are going away for Christmas and won't be taking the activity table with us Turtle has been allowed to play with the it immediately. Seeing as she is still only 14 months I don't think she will remember having toys before Christmas Day. 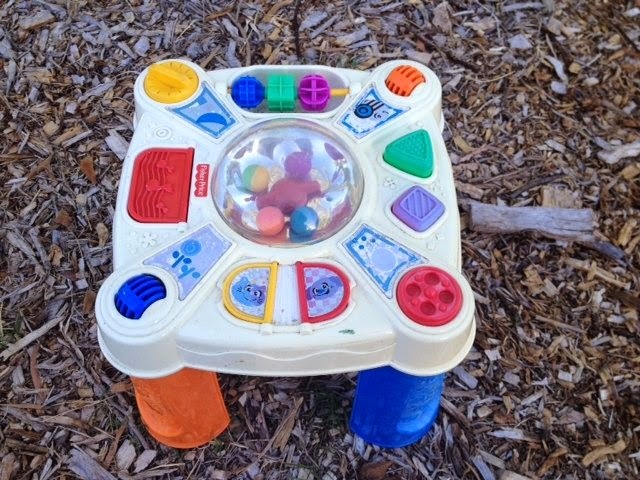 We have decided it will replace the slightly less flash activity table that we had picked up a couple of months ago from the roadside collection in the suburb over. 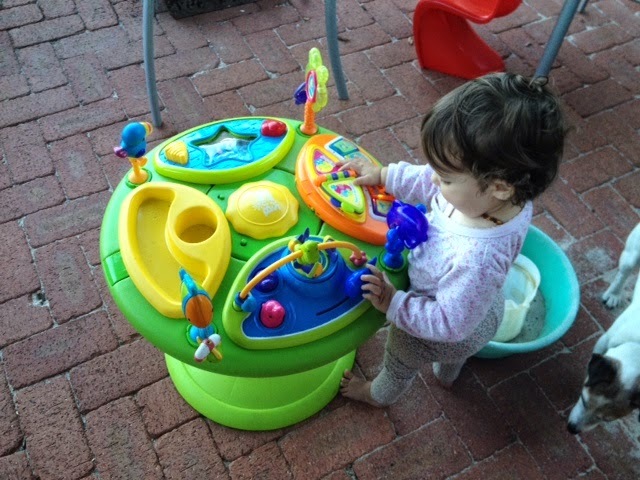 That one is a bit unpredictable with its music but Turtle still loved playing with it. I think salvaging treasures from other peoples trash is something to be respected and encouraged. It is not something that everyone seems to do (or at least talk about much if they do) but hopefully it is going to be become more and more popular as people realise that they can find great gifts that are cheap and that divert things from being wasted in landfill. I would love to hear about any creative gifts that you have salvaged or made from salvaged materials for loved ones. Please share your ideas in the comments below.